When you are recovering from carpal tunnel surgery, the goal is to get normal hand movement back, without causing unnecessary scarring. So it's important not to push things too hard. Do only as much as you are comfortable with – if your hand is painful you're doing too much. What can I expect as I recover? You should have full movement of your hand within 10 to 14 days of surgery. If you haven't, your doctor may refer you to a hand therapist. Most people can start increasing the amount of activity they can do at this stage. But avoid anything that causes pain in your hand. Talk to your surgeon about when you can return to work, which will depend on the type of work you do. You should also avoid any heavy lifting using the hand that was operated on for another four to six weeks. Regularly perform deep massage over the scar, to help break it up. Apply regular gentle pressure over the scar, as shown in the photo. It should feel like deep pressure rather than a superficial massage. Your wrist may be mildly uncomfortable for six to eight weeks after surgery. This is called pillar pain, and is nothing to be worried about. It should eventually get better by itself. What exercises and activities can I do? 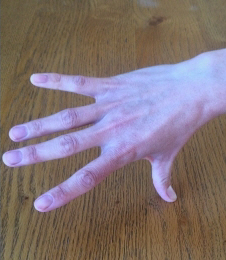 To regain strength in your hand, regularly do the thumb stretch as shown in the photo. Stretch your thumb on a flat surface, and hold for 30 seconds. This is particularly useful if you have muscle wasting at the base of your thumb. using a stationary bicycle (exercycle), without using the handlebars. Once you can safely put both hands comfortably on the steering wheel you can start driving. Automatic cars with power steering are usually easier to drive. If you're not sure about whether you are ready to drive, please talk to your surgeon.